The Girl With All The Gifts (2014) opens with ten year old, Melanie waiting in her cell to be collected for class. When they come for her, Sergeant Parks keeps his gun pointing at her while two of his people strap her into the wheelchair. She thinks they don’t like her. She jokes that she won’t bite. But they don’t laugh. 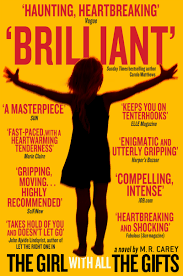 Melanie, along with twenty or so other children are being kept on an army base in a post apocalyptic Britain. Miss Justineau is one of the teachers and Melanie’s favourite. Bright and intelligent, she is obsessed with the tales her Miss Justineau has told her, tales about heroes fighting monsters, about overthrowing the titans who formerly ruled the world, and about Pandora, whose name means “all gifts”, the girl who unleashed so much misery upon mankind. She wonders about her parents and thinks of Pandora, who was made out of ‘gloopy clay’. She thinks this is better than having parents who you never get to meet. The children in this story are orphans, deprived of parents or even an adult who cares for them except for Miss Justineau. The story though, has much more than orphan-hood in it, things that I can’t mention by name otherwise I will be eaten alive. You will have to read it yourself and find out. At its heart in its simplest but most powerful form, is learning how to trust one another, and how once you have learnt to trust, love will follow. I loved this book. From page one I found myself rooting for Melanie, whatever was going on I wanted her to survive. The story gripped me and wouldn’t let go. If you’d like to try a different genre and are not sure what to read, give this a go, I promise, you won’t be disappointed. The Girl with all the Gifts is published by Orbit.